According to the Myth – Saturn is a god in ancient Roman religion, and a character in myth as a god of generation, dissolution, plenty, wealth, agriculture, periodic renewal and liberation. Saturn the planet and Saturday are both named after the god. As early as Livius Andronicus (3rd century BC), Jupiter was called the son of Saturn. Saturn had two mistresses who represented different aspects of the god. The name of his wife, Ops, the Roman equivalent of Greek Rhea, means “wealth, abundance, resources.” The association with Ops is considered a later development, however, as this goddess was originally paired with Consus. Earlier was Saturn’s association with Lua (“destruction, dissolution, loosening”), a goddess who received the bloodied weapons of enemies destroyed in war. The Romans built a temple to Saturn that was located near the Capitoline Hill in Rome. The Capitoline Hill was formerly called Saturnius Mons, or Saturn’s Mountain. The temple was first begun in the 6th century BCE, and it was consecrated in 497 BCE. Even today eight of its tall, imposing columns are still standing near the Roman Forum. The one who discovered was Galileo, he was the first to observe it with a telescope in 1610; he noted its odd appearance but was confused by it. Early observations of Saturn were complicated by the fact that the Earth passes through the plane of Saturn’s rings every few years as Saturn moves in its orbit. A low resolution image of Saturn therefore changes drastically. 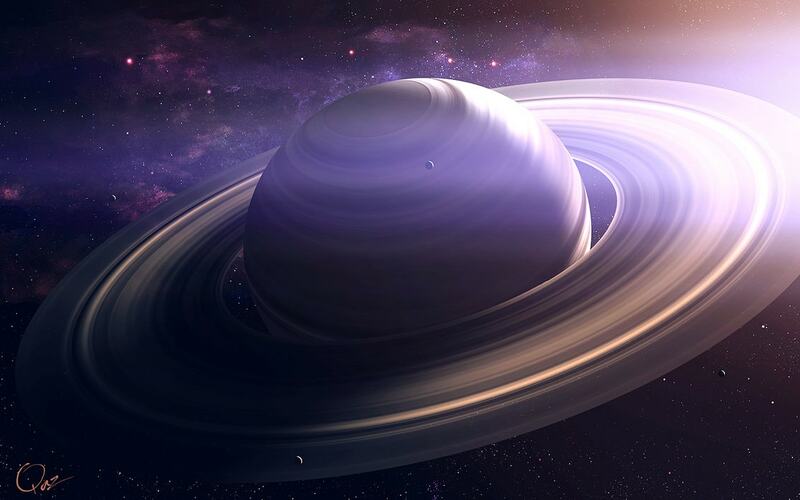 Saturn has been known since prehistoric times which is long-long ago. Saturn was first visited by NASA’s Pioneer 11 in 1979 and later by Voyager 1 and Voyager 2. Cassini (a joint NASA / ESA project) arrived on July 1, 2004 and will orbit Saturn for at least four years. Like Jupiter, Saturn is about 75% hydrogen and 25% helium with traces of water, methane, ammonia and “rock”. Saturn’s interior is similar to Jupiter’s consisting of a rocky core, a liquid metallic hydrogen layer and a molecular hydrogen layer. Traces of various ices are also present. Saturn has 62 named satellites. When it is in the nighttime sky, Saturn is easily visible to the unaided eye. Though it is not nearly as bright as Jupiter, it is easy to identify as a planet because it doesn’t “twinkle” like the stars do. The rings and the larger satellites are visible with a small astronomical telescope. Saturn is the sixth planet from the Sun and the second largest. orbit: 1,429,400,000 km (9.54 AU) from Sun. Diameter: 120,536 km (equatorial) and mass: 5.68e26 kg. In Greek mythology, Uranus was the god of the sky. There are several variations of his origins. Some say he was conceived by Gaia, who would become his wife, while others say that he was the son of Aether and Gaia. Others say that he did not have traditional parents and instead born from the primal form of the universe. His Roman equivalent was Caelus. While Uranus was a well-respected god in early mythology. Uranus was one of the first gods, and was known as Father Sky. Myths don’t go into too much detail regarding his duties but what they do tell us is that without Uranus, Greek mythology would have taken a much different turn. He and Gaia were responsible for some of the most important gods and beings found throughout Greek myths and legends. From other sources : Uranus, in Greek religion and mythology, the heaven, first ruler of the universe, son of Gaea (the earth). He was the father of Gaea’s children, the Titans, the Cyclopes, and the Hundred-handed Ones (the Hecatoncheires). Fearing that his children would rebel against him, he imprisoned them, but Cronos(Saturn), a Titan, with the help of Gaea, castrated him, thereby taking away his power. From the blood of Uranus that fell on Earth sprang the three Furies (the Erinyes), the goddesses of revenge. According to Hesiod, Aphrodite was born of Uranus’ discarded flesh and the foaming sea. Uranus was officially discovered by Sir William Herschel in 1781.It is too dim to have been seen by the ancients. At first Herschel thought it was a comet, but several years later it was confirmed as a planet. Herscal tried to have his discovery named “Georgian Sidus” after King George III. The name Uranus was suggested by astronomer Johann Bode. The name comes from the ancient Greek deity Ouranos. 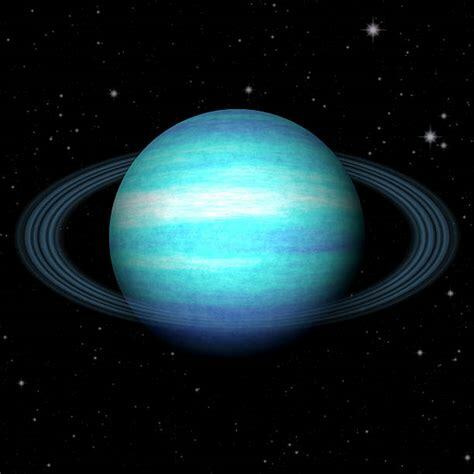 Uranus is often referred to as an “ice giant” planet. Like the other gas giants, it has a hydrogen upper layer, which has helium mixed in. Below that is an icy “mantle, which surrounds a rock and ice core. The upper atmosphere is made of water, ammonia and the methane ice crystals that give the planet its pale blue colour. Some Moon name are based on great novelist William Shakespeare like Oberon, Titania and Miranda out of 27.